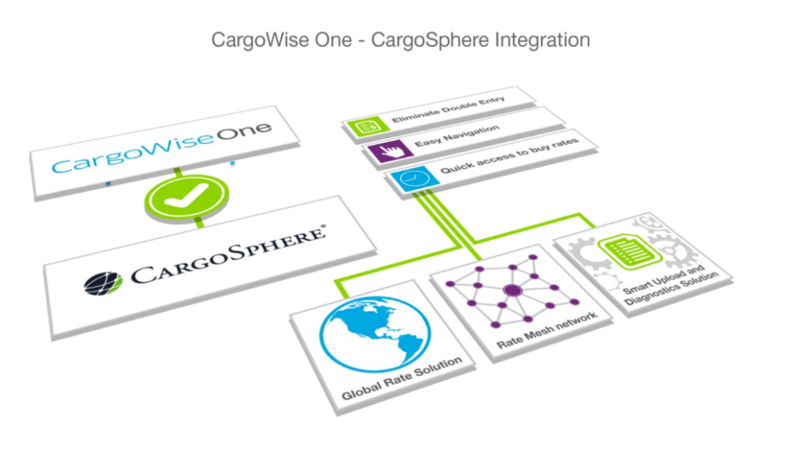 Chapel Hill, North Carolina, February 26, 2019 — CargoSphere, the neutral rate network for container shipping, today announces a seamless integration with CargoWise One, WiseTech Global’s flagship product. WiseTech Global is a leading developer and provider of software solutions to the logistics execution industry globally, whose customers include 12,000 of the world’s logistics companies across 130 countries, including 38 of the top 50 global 3PLs (third party logistics providers) and 25 of the top 25 largest global freight forwarders worldwide. Their powerhouse product, CargoWise One, enables logistics service providers to execute highly complex transactions and to manage their operations on one database across multiple users, functions, countries, languages and currencies. CargoSphere’s ocean rate ecosystem enables carriers including technology leading carriers Hapag-Lloyd and Maersk to deliver fully digital, automated confidential contract rates and amendments to their customers. This integration gives CargoWise One users access to CargoSphere’s industry-leading rate management functions, to achieve a more seamless transmission of vital pricing and shipping data and enhance the user’s experience. With rate integration and single sign-on to CargoSphere’s rate technology platform, users are given immediate access to standard and confidential contracts, rate searches, and the ability to quote and operationalize rates faster than ever. True digital rate connectivity from both CargoWise One and CargoSphere makes the management and distribution of rates much quicker, more accurate and removing the laborious and often error-laden process of manually rekeying, updating, and cross-checking carrier contract rates. In addition, users benefit from accuracy, time and cost savings, improved data quality, online access to timely rates for better decision making, faster reconciliation of invoices and faster quoting to customers. As the world’s connector for ocean rates, CargoSphere delivers effortless Web-based freight rate distribution, networking and rate management. CargoSphere’s Rate Mesh offers shipping partners immediate, confidential rate collaboration, simplifying rate communication and providing a faster, more effective way to receive and distribute ocean rates. CargoSphere offers business-enabling solutions that significantly improve the efficiency of processing ocean rates faster and more effectively. CargoSphere is part of the WiseTech Global group, a leading developer and provider of software solutions, including CargoWise One, to the global logistics execution industry. WiseTech Global is a leading developer and provider of software solutions to the logistics execution industry globally. Our flagship product, CargoWise One, forms an integral link in the global supply chain and executes over 44 billion data transactions annually. At WiseTech, we are relentless about innovation, adding more than 3,000 product enhancements to our global platform in the past five years while bringing meaningful continual improvement to the world’s supply chains. Our breakthrough software solutions are renowned for their powerful productivity, extensive functionality, comprehensive integration, deep compliance capabilities, and truly global reach.